"Lean in, place your hand on the small of her back, say it in her ear like a secret. But watch your hand placement, too high says, 'I just wanna be friends,' too low says, 'I just wanna grab some a"
This past Saturday, the weather was deary and provided a perfect opportunity for us to relax, together. We accomplished some Christmas shopping, then made our way to a matinee. 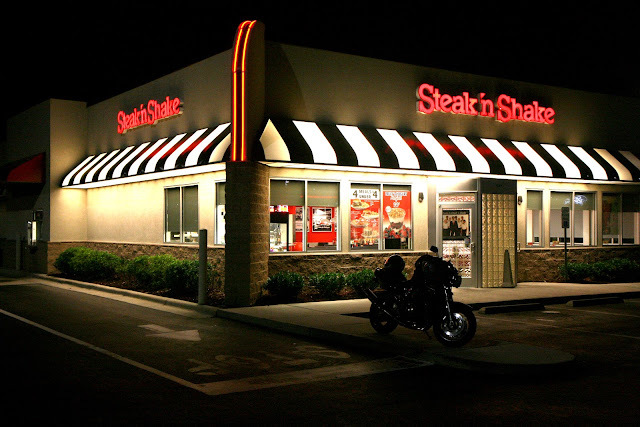 Afterwards, we pulled out of the theater, only to notice the Steak and Shake sign lit around the corner. Kyle gave me a look that beckoned me to travel down memory lane, so he turned right and we found ourselves in the same parking lot that began, what we now consider, our first date. We sat on the bar stools at the greasy restaurant that started it all, and couldn't help but smile at the college-aged couple in the same booth that we once sat. As the same smell of greasy fries filled the air, the same butterflies filled my stomach. As we walked out, one hand was full with our to-go bag, the other on my back. Sure, I'll sacrifice eating the burgers just for the nostalgia of good ole' Steak and Shake.